Welcome to Mind Your Business where amazing things happen for creative artists and entrepreneurs. 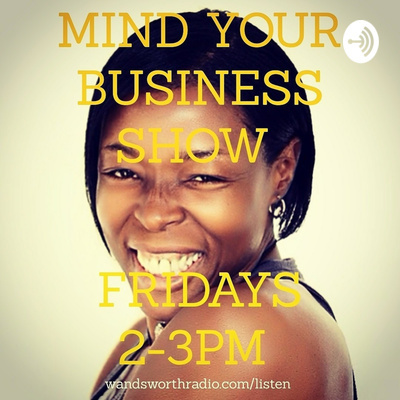 Mind Your Business is the award-winning show produced and presented by Nicolette Wilson-Clarke live on Wandsworth Radio on Fridays 2-3pm. It is a lively and inspiring show that celebrates and supports the ever-thinking mind of the creative with tips and tools for creative success. This week on Mind Your Business, Nicolette closed the month of October with sources of personal power like image power where you use how you present yourself to influence others and network power where who you know and who knows you can have a big effect on how influential you are. How do you grow these powers if they're presently in short supply? Listen to find out more. Nicolette continues to explore personal power. Once you understand that you have personal power, how do you keep it? Listen to find out more. Nicolette starts the month off with a brand new theme: Personal Power. What is it and how can we powerfully step into it everyday? Nicolette chats with professional dancer, choreographer and creative entrepreneur Maxine Anthony about her experience of resilience. Have you said 'Yes' to something when you really wanted to say 'No'? Nicolette opens the month of July with The Power of Saying No. She explores why we might say 'Yes' instead of 'No' and how we can stay true to ourselves in times of challenging decisions. embodiedentrepreneur.co.uk (Please note: the following 3 episodes precede Nicolette's shift from serving women entrepreneurs to serving creative entrepreneurs. For continuity purposes only, Nicolette has included these episodes).